What is the Tomb of Emperor Jingdi? Originally built in 153 BC and completed in 126 BC, Tomb of Emperor Jingdi is located around 20 kilometers north of Xi’an City. It is the sleeping place for Emperor Jingdi and his second wife - Princess Xiaojing. The tomb area is composed of the tomb of Emperor Jindi, Princess Xiaojing, over 10,000 accompanying tombs of officials and officers, the cemetery for criminals and more than 200 accompany pits. With four corners as guards, Tomb of Emperor Jingdi Area is centered on the tomb of the emperor. The north and the south are symmetrical. The west and the east are connected with each other. The layout is regular, and the structure is rigorous. It shows the royal consciousness of “supremacy over all”and strict hierarchy concept. 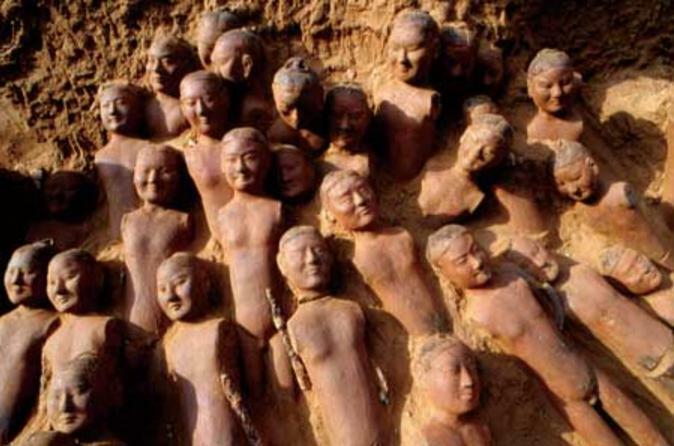 With accompanying pits filled with different pottery figurines, such as officers, officials, attendants and animals, Tomn of Emperor Jingdi is around 6 kilometers from the east to the west and 1 - 3 kilometers from the south to the north. It is square-shaped. It is not stolen or excavated at all. Tomb of Princess Xiaojing is located 450 meters northeast of the tomb of the emperor. Up to date, the northern area and the southern area in the Tomb of Emperor Jingdi are open to visitors. Visitors can enter the area from the entrance at the northern area. Visitors can take the shuttle bus with the ticket. There is an underground museum for visitors to explore in the northern area. The cultural relics visitors admire in the area are found in the accompanying pits. Glass walls and glass passages are applied in the underground museum to completely separate visitors from cultural relics in two different temperatures and humidity. ​When walking into the tomb passage and enter the museum, visitors will find pottery figurines and earthen jars. When looking down, visitors will find tens of thousands of cultural relics under their feet, including various pottery figurines, such as maids, animals, dancers, soldiers, etc. These pottery figurines are only 1/3 of the size of a real person. In addition, visitors can also appreciate the then living utensils, vehicles and harnesses. These objects will take visitors back to time. In the underground museum, visitors can enjoy the phantom imaging program which demonstrates the then court life. The area offers the archaeological showrooms and temple ruins in the southern area. Visitors can admire bronze spears, swords, arrows, the then coins, bronze mirrors and other daily necessities and pottery figurines, such as cavalrymen, warriors, and maids. Deyang Temple Ruins is situated to the west of the showrooms. There are no ground buildings but only the archaeological site. The best time to visit Tomb of Emperor Jingdi is in the morning as it is not hot during its opening hours. The best months to visit are from March to May, and from September to October. Tomb of Emperor Jingdi is located around 20 kilometers north of Xi’an City. Therefore, there is a few options. Rent a vehicle from Xi’an City, Xianyang City or Xi’an Xianyang International Airport. This is the quickest and most direct option. Take Bus Tourist 4 (游4) to the Stop of Hanyangling Museum (汉阳陵博物馆) from Xi’an Library. Take Bus 5 to the Stop of Hanyangling Museum from Xianyang Train Station. There are no restaurants in the area. Please take some food with you. The area offers English interpretation service for an additional fee of 200 CNY in total for a group of up to 10 persons for the underground museum and the archaeological showrooms. Visitors can join the simulated archaeological excavation for an additional fee of 150 CNY per person per hour. The minimum number of the participants is 5. Interested in visiting Tomb of Emperor Jingdi on a Tour? Wendy Wei Tours offers a variety of different packaged tours as well as custom tours including Tomb of Emperor Jingdi, among other attractions and destinations. To find out more, please visit our Tours page or Contact Us directly to find out more.